Following the recent devastating events in Paris, it seemed fitting to watch a movie about religious differences and how they affect (and don't affect) us in our day-to-day. The movie Arranged had been on my Netflix queue for a while, but (in pure Annie form) I was like "Ehhh...I'll get to that one later." Yesterday seemed the perfect time to check it out. Nasira and Rochel (the "ch" pronounced with that back-of-the-throat sound so common in Hebrew and French languages) are both teachers at a Brooklyn school. Though they start off as quiet strangers, they are quickly thrown into an unlikely friendship. Despite the fact that Rochel is an Orthodox Jew and Nasira is a Muslim, they bond over their shared fates being in an arranged marriage. What's great about this film is that it celebrates diversity without being blatantly secular. Instead of saying "oh religion is stupid!" each main character comes to the conclusion that they love their traditions and religions, despite being shoved into secular attitudes by their (somewhat overbearing) principal. And they give a nod to the secular experience as well. Rochel, after having a particularly hard time going on dates with weirdos, takes a minute to visit a cousin who isn't Orthodox Jewish anymore. And, without being hard on people that choose this kind of a lifestyle, decides that it isn't for her. 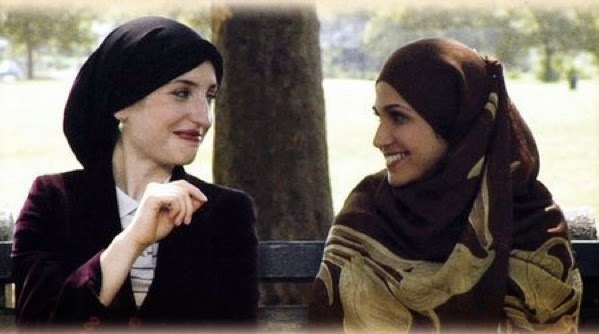 But honestly, the nicest thing about this movie is that is shows that interfaith friendships aren't impossible. Despite their parents' blatant disapproval, Rochel and Nasira end up being extremely close, to the point where Nasira goes out of her way to help Rochel find a proper suitor! There are shots, also, of each of them striving to understand each other's religion. From Rochel letting Nazira henna her hand to Nazira going with Rochel to pray at her grandmother's grave, there are small moments where they learn to accept each other. And, especially in the spirit of this week, that kind of tolerance between two very strict religions is invaluable. A lovely movie. Believable yet powerful. 8.5 outa 10. This sounds really good. I'm intrigued, for sure. I'm all for a movie that shows religious differences in a way that isn't so 'black and white' or 'preachy' in tone.